FILINGS with Bursa Malaysia show that 44 companies, worth RM2.68 billion, in Lembaga Tabung Haji’s (TH) equities portfolio had been transferred to Urusharta Jamaah Sdn Bhd as at Jan 3. Urusharta Jamaah is the special purpose vehicle (SPV) set up by the Ministry of Finance to receive the pilgrims fund’s underperforming assets. What might the SPV do with the portfolio? The SPV is set to take over RM19.9 billion worth of underperforming properties and equities as part of TH’s restructuring exercise. Some 80% of the assets to be transferred are equities, with properties making up the remaining 20%. The aim is to allow TH to close the gap between its assets and liabilities. Currently, TH has only about 80 sen worth of assets for every RM1 of liabilities. The equities that will be transferred comprise those that have seen a decline of more than 20% in value. The SPV is then supposed to recover the value of the assets over a number of years. This is similar to what Danaharta Nasional Bhd did when it took over the nonperforming loans of banks after the 1997/98 Asian financial crisis. Fund managers say there are three things the SPV could do with the portfolio. It is worth noting that a significant number of the shares transferred to the SPV are those of fairly decent companies. “The first thing to do is to relook at all the stocks and their valuations. There are some good stocks in there, or those that are undervalued. Not all of them are bad. One option is to hold on to them and benefit from capital gains over the years. This could be relevant for those stocks where the shareholding is low,” says one fund manager. As for troubled companies in which TH has a substantial stake, a local fund manager says they should be considered for possible restructuring, with the ultimate aim of turning them around and, in time, lifting their share price. “As for those with no hope — in other words, there is no way of saving them — I would probably sell them to get whatever I can and reinvest the proceeds in other equities that can grow for the future,” the fund manager says. One of the most recent transfers was 17.33 million shares or 5.24% equity interest in Notion VTec Bhd, which is involved in designing and developing high-precision cutting tools. Bloomberg data show that TH emerged as a shareholder in the company on Aug 25, 2010. The pilgrims fund’s average investment cost was 92 sen per share, meaning that the value of its investment has declined by 36%, based on Notion VTec’s closing share price of 58.8 sen on Jan 2. However, the technology counter has risen 35% over the past two years, from 43.3 sen per share at end-2016 to its Jan 2 closing. Net profit for the financial year ended Sept 30, 2018 (FY2018) rose 3.5 times to RM44.73 million year on year as a result of insurance claim settlements. 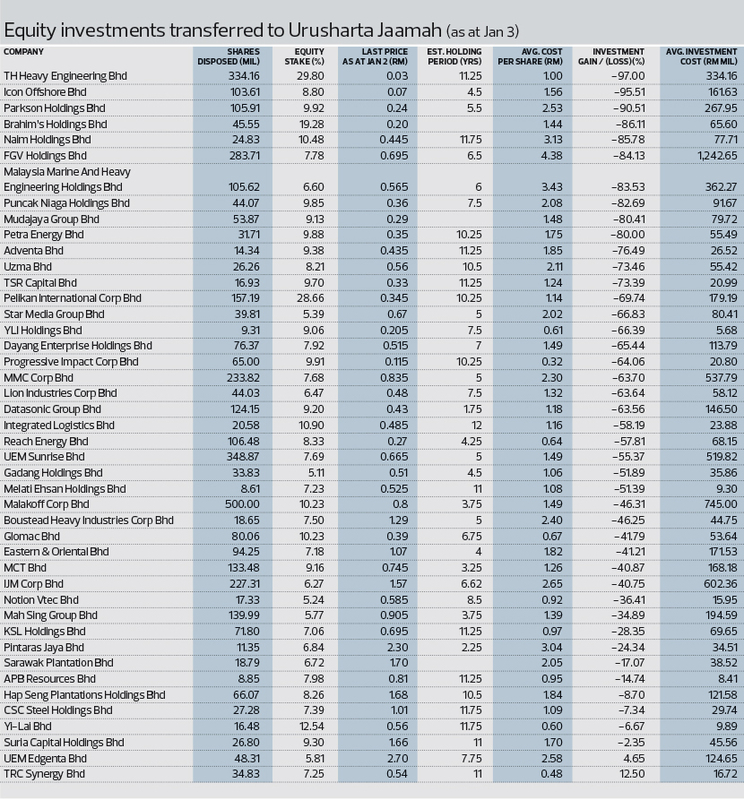 The most costly investment transferred to the SPV is that in FGV Holdings Bhd. TH first entered the plantation group in September 2012, several months after the latter’s behemoth initial public offering. The average cost of investment was RM4.38 per share, or RM1.24 billion. Filings with Bursa show that TH transferred a 7.78% stake in the plantations counter to the SPV and ceased to be a shareholder. Based on FGV Holdings’ Jan 2 closing price of 69.5 sen, TH has lost 84% on its investment. To be fair, TH is not the only one that has suffered a loss on investments in FGV Holdings, which listed at RM4.55. Many early investors would have made losses given the troubling news on the financial and management issues at the company. However, TH’s biggest loss comes from TH Heavy Engineering Bhd, in which it held a 29.8% stake. The group is involved in the fabrication of offshore oil and gas facilities. This is also TH’s longest estimated holding period at 11 years, and the largest stake it held among the companies transferred to the SPV. TH first emerged as a substantial shareholder in the then Ramunia Holdings Bhd on Nov 2, 2007, and by Dec 24, had enlarged its stake to 5.18%. TH held on to Ramunia despite heavy losses and continued to accumulate shares in the company and by Feb 28, 2009, owned 29.68% equity interest, making it the largest shareholder. Ramunia was classified as a Practice Note 17 company on March 1, 2010, but managed to turn around in the financial year ended Oct 31, 2010 (FY2010), with a net profit of RM67.99 million, mainly through the disposal of assets. Two years later, it exited PN17 status but the respite was short-lived. Renamed THHE in 2010, its performance started to deteriorate in the last quarter of FY2013 and by FY2015, it had to undertake the issuance of 1.1 billion irredeemable convertible preference shares (ICPS) to stabilise its financials. TH was the only subscriber, pumping in RM275 million for 99.76% of the five-year tenured instruments. Should TH convert the ICPS, it will control more than 64% of THHE. The group is again a PN17 company, falling into the category in April last year after its external auditor said it was disclaiming its audited financial statements for FY2016 because of various financial issues. At the time of writing, THHE had yet to come up with a regularisation plan. It has been granted another extension and must submit a plan on or before April 25 next year. TH’s average investment cost in THHE was RM1 per share and, as at Jan 2, it had suffered a 97% loss with the share price closing at 3 sen apiece. Oil and gas company Icon Offshore Bhd is another heavy loser for TH. With an average investment cost of RM1.56 per share, TH has lost 95% of its investment, with the counter closing at 7 sen apiece on Jan 2. Icon Offshore has also been struggling. As at Sept 30, 2018, it saw a cumulative nine-month net loss of RM24.8 million, double that of the previous year. Based on investment cost, TH has transferred RM7.13 billion worth of equities to Urusharta Jamaah as at Jan 3. But based on market value, the figure is RM2.68 billion. TH still has some way to go to reach 80% of the RM19.9 billion worth of underperforming properties and equities it is looking to transfer.